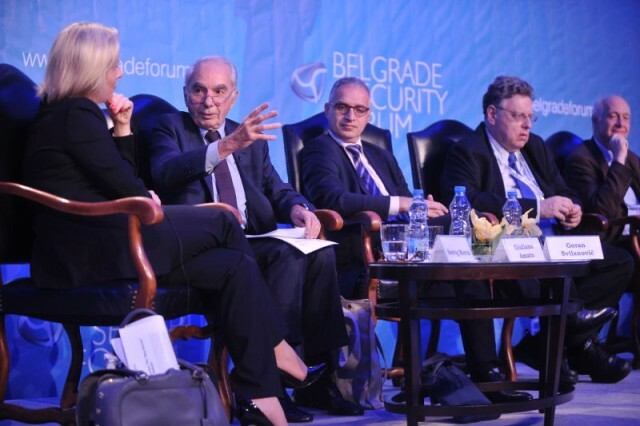 Belgrade Security Forum certainly represents one of our most significant achievements – starting in 2011, four successful international conferences have been held at the highest level, with the inaugural forum posing the question What Brings Us Together – What Sets Us Apart? – and by that referring to the region’s ever present strategic anxiety. BSF – now an acronym that is known to many – holds today a firm place on the European map of major security events, right along with the Brussels Forum, GLOBSEC in Bratislava, or the Riga conference. Organized in cooperation with the Belgrade Centre for Security Policy and the European Movement in Serbia, the BSF has quickly become a point of interaction between the regional security community and European and world leaders, intellectuals and opinion makers, as well as a place of creative exchange and provocative debate about the future. To present Balkan achievements and dilemmas to the participants in the European and global security debate. BSF is in many different ways supported by numerous partners and donors. For more information, visit its website www.belgradeforum.org. Departure of Trump's "man for Europe"
After London: What Next for the Berlin Process? Results of the London summit were indeed underwhelming. One declaration and one technical agreement signed can be hardly seen as a success. Yet this is the state of regional cooperation. Beyond declarations, leaders conflict over past, present and future. Call for BSF volunteers 2018: deadline extended to 15 June! Community yes, but what kind of? How realistic is "perspective 2025"? Towards the “new normal” in international relations? What defines foreign policy of one country, and what of Serbia? War games in the times of mistrust: exercise "Zapad 2017"
What does Russia want: return to the system of "European concert"?